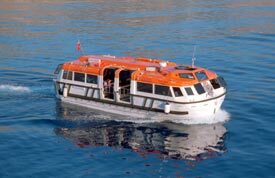 ABOVE: A tender shuttles passengers from the anchored Silver Whisper to the waterfront in Monemvasia, Greece. The cruise line provides a sailing calendar, itineraries, deck plans, fares, and other information to help you book or fantasize a luxury cruise. View 61 ship photos, with captions that describe the Silver Whisper and the Silversea cruise experience in detail. This sequel to our Mediterranean cruise article takes the Silver Whisper (and you) from Copenhagen to London Tilbury by way of Scotland, Northern Ireland, the Channel Islands, and Belgium. It includes 65 new Silversea pictures. If you want the convenience of an escorted tour without the agonies of bus travel, daily hotel check-ins, and constant packing, try a "port-intensive" cruise instead. Linda Coffman's cruise diary gives a day-by-day account of a 2002 voyage from Istanbul to Genoa on the Silver Whisper. Linda Garrison describes a 2002 cruise from Barcelona to Lisbon at cruises.about.com. Her report includes a photo gallery. "SteveBear" serves up dozens of pictures from the Silver Whisper, including close-up photos of lunch and dinner dishes. Jana Jones describes a transatlantic voyage aboard the Silver Whisper's sister ship, the Silver Shadow at Sleeping-Around.com. Also see her cruise photo album.